Last month, I listed a few reasons for publishing the expenses of this trip, month by month and day by day. An event-filled August has since come and gone, so here are our costs for our second month biking around the world. 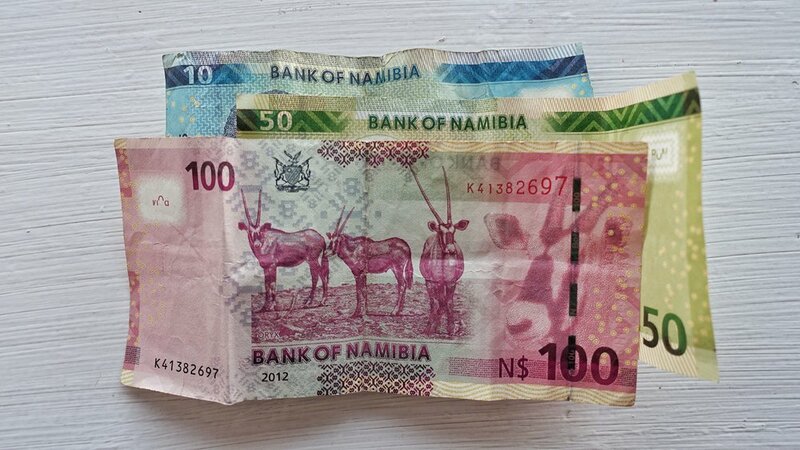 (As of August 2017, 1 US Dollar [USD] = 13.5 Namibian Dollars [NAD] and 1 US Dollar [USD] = 10.21 Botswanan Pula [BWP]. Because we're dealing with multiple exchange rates, the day-to-day expenses are listed in their respective currencies, but the monthly totals are calculated in USD). We slept 17 nights wild camping, 9 nights in a campground, 3 nights in a guesthouse or hotel, and 2 nights with Couchsurfing hosts. Almost all of our food expenses were groceries, including a few meals we cooked for our hosts. At certain points in Namibia, we were really generously treated to drinks or meals from people we met. Namibia featured long stretches of empty, slow gravel roads, so we'd often spend nothing for days at a time, then help ourselves to a campground and stock up for the next remote leg whenever we reached a town. 479 food, 350 accommodations. Guesthouse in Karasburg. 143 food. Wild camping en route to Koes. Wild camping en route to Koes. 242 food, 400 accommodations. Hotel in Koes. 222 food, 400 accommodations. Hotel in Koes. 130 food. Wild camping en route to Gochas. Wild camping en route to Gochas. 265 food, 240 accommodations. Campground in Gochas. 60 food, 240 accommodations. Campground in Gochas. 22 food, 240 accommodations. Campground in Gochas. 224 food, 240 accommodations. Campground in Gochas. 89 food, 240 accommodations. Campground in Gochas. 201 food, 240 accommodations. Campground in Gochas. Wild camping en route to Stampriet. 210 food. Wild camping en route to Leonardville. Wild camping en route to Leonardville. 48 food. Wild camping en route to Gobabis. Wild camping en route to Gobabis. 846 food. Couchsurfing in Gobabis. 334 food. Couchsurfing in Gobabis. 240 accommodations. Campground in Buitepos. ENTERED BOTSWANA; REMAINING EXPENSES IN BWP. 12 food. Wild camping en route to Ghanzi. 7 food. Wild camping en route to Ghanzi. 136 food, 160 accommodations. Campground in Ghanzi. 331 food, 160 accommodations. Campground in Ghanzi. Wild camping en route to Maun. In addition to the day-to-day sustenance-and-shelter expenses, there are a few incidental and recurring costs worth mentioning. We paid a 500 NAD reward to recover Lauren's lost cell phone in Namibia. On a monthly basis, we're also paying 15 USD for a family subscription to Google Play Music (which allows us to download music to our phones for the many hours of riding) and about 25 USD for Google Fi cell service (which allows us to send messages and use the internet, sparingly, when not in a wifi zone). Fi works almost everywhere in the world, but not Namibia and Botswana. Fortunately, service can be paused and resumed at will, so our cell costs for this particular month were 0 USD. Finally, Lauren's parents got her a satellite messenger for peace of mind in the event of an emergency; they are, very kindly, covering the 25 USD monthly subscription. Any questions about our expenses to date? Just drop us a line below.